BARCELONA: A magical Lionel Messi and on-form Luis Suarez scored doubles apiece as champions Barcelona thrashed newly-promoted Huesca 8-2 to join Real Madrid at the top of La Liga on Sunday. Barca’s third win of the campaign in as many games saw Ernesto Valverde’s men go top thanks to superior goal difference over Real before the break for Nations League matches. Real Betis ended a 12-year wait for a home victory over local rivals Sevilla by winning the local derby 1-0, Valencia are still without a win this season after being held to a 2-2 draw at neighbours Levante and Alaves came from behind to beat visiting Espanyol. Newly promoted Huesca enjoyed short-lived celebrations after stunning Barca with a goal just three minutes into their first league visit to the Nou Camp when Colombian forward Cucho Hernandez deflected the ball in from point-blank range. 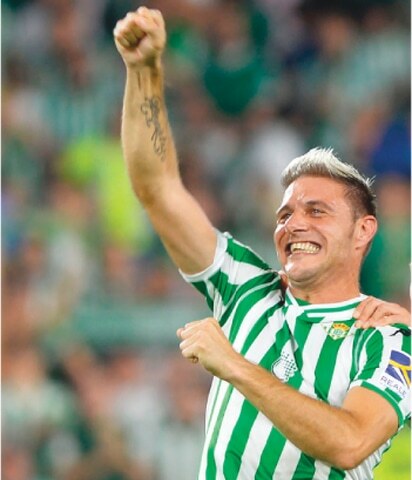 Veteran forward Joaquin Sanchez went on as a late substitute and headed Betis to their first home win over Sevilla since 2006. The 37-year-old Sanchez became the oldest scorer in a Seville top-flight derby when he rose to head home at the near post in the 79th minute, shortly after the visitors had had midfielder Roque Mesa sent off for two bookings at Benito Villamarin Stadium. Valencia started this season with the two objectives of doing well on their long-awaited return to the Champions League and maintaining a top-four finish in Spain. But three matches into the season and Marcelino Garcia’s team have yet to win. Valencia twice had to come from behind to salvage a 2-2 draw at 10-man Levante, their crosstown rivals, on Sunday. Roger Marti scored both goals for Levante, with Denis Cheryshev making it 1-1 before Dani Parejo split the points by converting a penalty early in the second half. Levante’s Coke Andujar picked up a second booking in the 76th. The video assistant referee awarded a penalty in favour of Espanyol and annulled a goal by the Barcelona-based side in a 2-1 loss at Alaves. Leo Baptistao converted the penalty, only for Alaves to fight back with goals by Borja Baston and Ruben Sobrino.